The History of Valentine and Orson, Published for the Company of Walking Stationers Images from Rare Books and Special Collections, McGill University. ſhe was big with Child, yet ſhe was compelled to <pb n="3"
lady Belliſant having followed the bear to no pur<pb n="4"
<p>Valentine being much bruiſed, got up and went towards his brother in great anger: but Orſon ran to a tree, and the <pb n="7"
where he preſented him to King Pepin, who had the Wild Man baptized by the name of Orſon, from his being taken in a wood. <said>Yes</said>, replied the Duke, <said>I have ſeventeen</said>, and then ſhewed them to <pb n="9"
<p><said>"Thou famous Knight of royal extract art called Valentine the vlaient, who of right ought to marry the lady Clerimond. 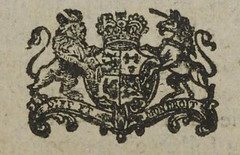 two forth in the foreſt of Oreleans; he was <pb n="12"
to fetch them into Portugal the bet<pb n="13"
Chriſtendom, to whom he had been a no<pb n="16"
I. THE HISTORY OF Valentine and Orson. THEHISTORYOFValentine and Orson. Reader, you'll find this little Book containsEngough to answer thy expense and pains;And if with caution you will read it through,'Twill both instruct, and delight thee too. Printed for the Company of WalkingStationers. IT is recorded, that PEPEN, King of France, had a fair ſiſter named Belliſant, who was married to Alexander, the Emperor of Greece, and by him carried to his Capital at Conſtantinople; from whence, after having lived with great virtue, ſhe was baniſshed through the means of a falſe accuſer, whom the had ferverely checked for his imprudence; and though at the ſame time ſhe was big with Child, yet ſhe was compelled to ( 3 ) leave her huſband's empire, to the great regret of the people, attended only with a ſquire named Blandiman. After great fatigue and travel, ſhe arrived in the foreſt of Orleans, where finding her pains come thick upon her, ſhe diſmiſſed her attendant for a midwife, but before his return was delivered of two lovely children, one of which was conveyed away by a ſhe bear, but ſhe willing to ſave it purſued on her hands and knees, leaving the other behind. 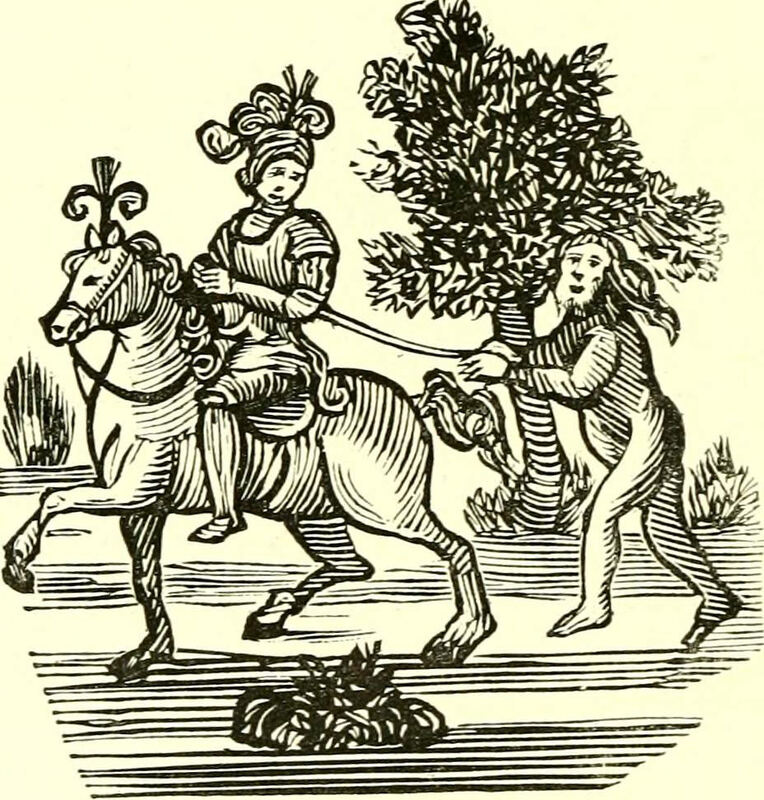 But before her return, King Pepin being a hunting in the foreſt, came to the tree where ſhe left the other babe, and cauſing it to be taken up, ſent it to nurſe, and when it grew up called his name Valentine.—Blandiman at length came back, and inſtead of finding his miſtreſs found her brother Pepin at the tree, to which he declared all that had happened, and how his ſiſter was baniſhed through the falſe ſuggeſtions of the arch prieſt; which when King Pepin heard he was greatly enraged againſt the lady Belliſant, ſaying the Emperor ought to have put her to death; ſo leaving Blandiman, he returned to his nobles at Paris.—The lady Belliſant having followed the bear to no pur ( 4 ) poſe, returned to the place where ſhe had left the other babe; but great was her ſorrow when Blandiman ſaid he had ſeen her brother Pepin, but could tell nothing of the child; and having comforted her for the loſs of it, they went to the ſea-ſide took ſhipping, and arrived at the caſtle of the Giant Feragus, in Portugal. All this while the bear nouriſhed the infant amongſt her young ones, until at length it grew up a wild hairy man, doing great miſchief to all that paſſed thro' the foreſt; in which we will leave him, and return to the arch prieſt, who did great miſchief, till he was impeached by a merchant of having wrongfully accuſed the Empreſs; upon which they fought, and the merchant conquering, made the prieſt confeſs all his treaſons, the Emperor wrote about it to the King of France, and he was hanged. CHAP. II. 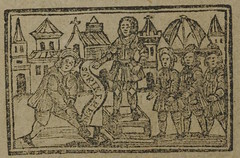 Valentine conquers his Brother in the foreſt of Orelans. NOW was Valentine grown a luſty young man, and by the King as greatly beloed as if he had been his own ſon: commanding him to be taught the uſe of arms, in which he ſoon became ſo expert, that few in the court dared to encounter him: which made Hufray and Heny the King's baſtard ſons exceedingly envy him. At this juncture great complaints were made againſt the Wild Man, from whom no Knight had eſcaped with his life, that had encountered him: which made the King promiſe a thouſand marks to any that would bring him dead or alive, which offer none dare except; but Hufray and Henry deſired King Pepin to ſend Valentine, with a view of getting rid of ſo powerful a rival in the King's favour, but his Majeſty ſeeing their malady, was very angry, telling them, he would rather loſe the beſt Baron in the land. However Valentine deſired leave of his Majeſty to go to the foreſt, reſolving either to conquer the Wild Man, or die in the attempt. Accordingly having furniſhed himſelf with a good horſe and arms, he ſet forward on his journey, and after two days travelling, he arrived in the foreſt; in the evening he tied his horſe to a large ſpreading oak, and got up in a tree himſelf, for his ſecurity, where he reſted that night. Next morning he beheld the Wild Man traverſing the foreſt in ſearch of his prey, at length he came to the tree where Valentine's horſe ſtood, from whom he pulled many hairs, upon which the horſe kicked him. The Wild Man feeling the pain, was going to tear him to pieces, which Valentine ſeeing, made ſigns as if he would fight him, and accordingly he leaped down, and gave him a blow, but the Wild Man caught him and threw him to the ground. Then taking up Valentine's ſhield, he beheld it with amaze, with reſpect to the divers colours thereon emblazoned. Valentine being much bruiſed, got up and went towards his brother in great anger: but Orſon ran to a tree, and the ( 7 ) they engaged; but both being terrible wounded gave out by conſent; after which Valentine ſigned to Orſon, that if he would yield to him, he would order matters ſo as he ſhould become a rational creature. Orſon thinking that he meant him no harm, ſtretched forth his hand to him; upon which he bound him, and then led him to Paris, where he preſented him to King Pepin, who had the Wild Man baptized by the name of Orſon, from his being taken in a wood. Orſon's actions during their ſtay there very much amuſed the court, that at length the Duke of Acquitain ſent letters importin, that whoſoever would overthrow the Green Knight, a pagan champion, ſhould have his daughter Fazon in marriage. Upon which propſition Valentine ſet out for that province, attended by his brother Orſon, by which means he came to the knowledge of his parents, as we ſhall find hereafter. CHAP. III The fight between Orſon and the Green Knight. "Sweet creature, King Pepin has ſent me hither with the braveſt Knight in all his realm to fight the Green Knight, who though he his dumb and naked, is endued with ſuch valour, that no Knight under the ſun is able to cope with him." During this ſpeeched ſhe viewed Orſon narrowly, and he her; but ſupper coming in, interrupted them, and they ſat down to eat. Whilſt they were in the midſt of all their feaſtings, the Green Knight entered ſaying, Duke Acquitain haſt thou any more Knights to cope with me for thy daughter? Yes, replied the Duke, I have ſeventeen, and then ſhewed them to ( 9 ) him. The Green Knight then ſaid to them, eat your fill, for to-morrow will be your laſt. Orſon hearing what he ſaid, was much incenſed againſt him, and ſuddenly riſing from the table, threw the Green Knight with ſuch force againſt the wall as laid him dead for ſome time; which very much pleased the whole company. Next day many Knights went to fight the Green Knight, but he overcame and ſlew them all; till at laſt, Orſon being armed in Valentine's armour, came to the Green Knight's pavilion, and defying him, they began the moſt deſperate combat as ever was heard of, and the Green Knight made ſo great a ſtroke at him, as to cut of the top of his helmit, half his ſhield, and wounded him much. But this ſerved only to enrage the valiant Orſon, who coming up to him on foot, took hold of him, and pulled him from his horſe, got aſtride him, and was juſt going to kill him, but was prevented by the ſudden arrival of Valentine, who interceded with Orſon to ſpare his life, on condition of his turning Chriſtian, and acquainting King Pepin how he was conquered. The Green Knight having promiſed to perform all that was deſired, they led him priſoner to the city of Acquitain, and the Duke recieved them with great joy, and offered the lady Fazon to Orſon; but he would not marry her till his brother had won the Green Knight's ſiſter, lady Clerimond; not till they had talked with the enchanted head of braſs to know his parents, and get the proper uſe of his tongue; which when the lady knew ſhe was very ſorry, because ſhe loved Orſon, and was reſolved to marry none but him, who had so nobly conquered the Green Knight. CHAP. IV. Valentine and Orſon go in ſearch of Lady Clerimond, who had the Brazen Head in her poſſeſſion. VALENTINE and Orſon having taken leave of the Duke of Acquitain and his dauther Fazon, proceeded on their journey in ſearch of the lady Clerimond, and at laſt came to a tower of burniſhed braſs; which upon enquiry, they diſco ( 11 ) vered to be kept by Clerimond, ſiſter to Feragus and the defeated Green Knight, and having demanded entrance was refuſed it by the centinal who guarded the gate, which provoked Valentine to that degree, that he run againſt him with ſuch fury that the centinal fell down dead immediately. "Thou famous Knight of royal extract art called Valentine the vlaient, who of right ought to marry the lady Clerimond. Thou art, ſon to the Emperor of Greece Empreſs Belliſant, who is now in the caſtle of Feragus, in Portugal, where they have reſided for twenty years. King Pepin is thine uncle, and the Wild Man thy brother; the Empreſs Belliſant brought ye two forth in the foreſt of Oreleans; he was ( 12 ) taken away by a ravenous bear, and thou waſt taken up by thy uncle Pepin, who brought thee up to man's eſtate. Moreover I likewiſe tell thee, that thy brother ſhall never ſpeak till thou cutteſt the thread that grows under his tongue. The Brazen Head having ended his ſpeech, Valentine embraced Orſon and cut the thread which grew under his tongue; and he directly related many ſurpriſing things. After which Valnetine married Lady Clerimond, but not before ſhe turned Chriſtian. In this caſtle lived a dwarf, named Pacolet, who was an enchanter, and by his art had contrived a horſe of wood, and in the forehead a fixed pin, by turning of which he could convey himſelf to the fartheſt part of the world. This enchanter flies to Portugal, and informs Feragus of his ſiſter's nuptials, and of her turning Chriſtian; which ſo enraged him that he ſwore by Mahomet he would make her rue it, and thereupon he got ready his fleet, and ſailed towards the castle of Clerimond, where when he arrived he concealed his malice from his fiſter, and alſo the two Knights, telling them that he came to fetch them into Portugal the bet ( 13 ) ter to ſolemnize the marriage, and he would turn Chriſtian at their arrival at the caſtle, all which they believed, and ſoon after embarked with him. When he had got them on board, he ordered them to be put in irons, which ſo grieved his ſiſter Clerimond, that ſhe would have thrown herſelf into the ſea had ſhe not been ſtopped. CHAP. V. Pecolet comforts the Ladies, and delivers Valentine and Orſon out of Priſon. In the dead of the night he goes to the dungeon, where lay Valentine and Orſon bound in chains, and touching the doors with his magical wand they flew open; and coming to the Knights, he releaſed them and conducted them to the apartment where Belliſant and Clerimond were, who were exceedingly tranſported; but Pacolet hindered them from diſcourſing long by telling them they muſt depart before the guards of Feragus awaked, which would put a ſtop to his proceedings. So Pacolet led them to the gates of the caſtle, and having prepared a ſhip he conveyed them to Lady Fazon, at the City of Acquitain; next morning when Feragus heard of their eſcape, he was enraged to the laſt degree. The Knights and Ladies being out of danger, ſoon arrived at Acquitain, to the great joy of Lady Fazon, who was ſoon after married to Orſon with great ſolemnity; upon which tilts and tournaments were performed for many days; but Valentine carried the prize by overthrowing at leaſt above an hundred brave Knights. ( 15 ) CHAP. VI. Valentine dies, and Orſon turns Hermit. NOW Valentine being greatly diſtreſſed in his mind for the death of his father, (who lately died) reſolved to make a pilgrimage to the Holy Sepulchre; and thereupon taking leave of his wife Clerimond; and giving the government of the Empire unto his brother, he departed, to the great ſorrow of all, particular his mother Belliſant, and the fair Clerimond. Valentine, after ſeven years absence returned, dreſſed like a poor palmer, begging victuals at the gate of his own palace; and at length being ſick and about to die, he called for Clerimond and made himſelf known to her, at which ſhe was ready to give up the ghoſt. At laſt having recommended the care of her to his brother, and the Empreſs, his dear mother, and bleſſing of them, he turned on one ſide, and breathed out his noble ſoul from his illuſtrious body, to the great grief of all the valiant Knights of Chriſtendom, to whom he had been a no ( 16 ) ble example, and a generous reliever of.—But Clerimond never could eſpouſe any one, but betook her to a ſingle life, always lamenting the loss of her beloved huſband. After his death, Orſon governed the Empire with great wiſdom and juſtice for ſeven years, till at length, ſeeing the frail ſtate of human affairs, he gave the charge of his Empire, Wife, and Children, to the Green Knight, and then turning Hermit, he became reſident of the foreſts and woods, where, after living to a great age, this magnanimous and invincible hero ſurrendered up his body unto never ſparing death, and his ſoul to the immortal deities of whoſe attributes it had a true reſemblance. Thus reader, you may ſee that none with-ſtandTho' great in valour, or in vaſt command,The mighty force of death's all conquering hand. Finis.